Not happy with the 2 scale I bought smart weigh only had it for a few weeks going up and down at times only by 0.01 most times and 0.05 only 2 times so far. But I want it perfect any ideas what the best scale would be. Don't worry about the cost as my health is vital. I successfully tapered 2 meds (not at the same time) over the past 4 years using the directions on this forum for making a liquid. Liquid preparations are generally more accurate, simpler, and less of a headache to prepare. Go to the upper right hand corner and enter 'liquid' into the search for this thread.. you will find a lively and informative discussion on the pros and cons of both options. You seem to have an aversion to making your own liquid which is not based on any real world experience. Perhaps it's time for you to give this method a try to see if it works better for you. As you are probably aware, among forum members, making a liquid suspension is much more popular than using a scale. This for some of the very reasons you have described above. I checked on the scale listed in post #1 of this thread. For those still looking to buy the scale, it's now listed on Amazon as the American Weigh Scales Gemini G-20 Portable Scale. A risk with that scale and others available for less than 1,000 USD: It is probably not sufficiently precise for measuring pharmaceutical doses. Measurement systems have several important characteristics, among them accuracy and precision or repeatability. Although we sometimes use those two words interchangeably in everyday language, they have different meanings here. Accuracy is the ability of the scale to weigh the true value. Precision/Repeatability is the ability of the scale to yield the same result (weight) when the exact same item is measured under the same conditions. For clarity, view the diagrams (the "bullseyes") on the Scale Terminology page of American Weigh Scales (AWS) site. They illustrate the difference between the two concepts. We want scales to have both high accuracy and high repeatability/precision. Inaccurate scales can be calibrated. Insufficient repeatability/precision is a more challenging problem to address and likely out of our hands with these consumer scales. The AWS Gemini G-20 specifications page details many characteristics of the scale, including readability and repeatability. Readability refers to the smallest unit that can be read on the digital display. The G-20 can measure 0.001g or 1mg. The repeatabilty is ±2d; this means ±2 of the smallest unit that can be read. You may be asking -- if you've read this far -- "So what?" Well, this means that we could weigh what we think is 500 mg of a supplement powder several times and get different results: 501mg, 498 mg, 500 mg. As someone tapering Cymbalta, I could also weigh beads from a capsule to achieve a 10 mg dose several times and get 11 mg, 8 mg and 10 mg. See the problem for anyone with a sensitized central nervous system? Especially as one reaches the end of a taper? Join me in a sigh or a favourite curse word. To get the precision we might want, we'd have to buy a commercial/pharma grade scale well over 1000 USD, 20-25 times the cost of the scales on Amazon. Again, feel free to sigh and/or curse. I had hoped the weighing would save the time and tedium involved in counting beads. Making a liquid is one solution. Cymbalta beads, however, are enteric-coated and lose efficacy if dissolved into liquid. If you're using Effexor XR check whether the beads are enteric-coated; they may be. I'm not sure what I'm going to do to address this. I'll post what I come up with both in the Tips for tapering off Cymbalta thread and in my Introduction thread. I see how successful you were w/ similar drug history and liquid tapering. So here it is...6 or 7 years ago, when I stopped dry-cutting and became a micro-taperer, I tried a couple things. First I had my pharmacist make up a solution for me which was a HUGE hassle. Because of my extreme sensitivity, I have to use name brand instead of generic, so I had to get the name brand valium from the big-box pharmacy and take it to the compounding pharmacist and was treated as though I was a criminal or something. I got very sick almost immediately from this solution, even w/o cutting anything...just letting my body adjust to the solution. Perhaps I was sick from the medium he dissolved it in. So then I thought, what the heck, and tried dropping my whole dose in water and drinking the whole amount (after it dissolved). I felt immediate, extreme w/d effects. Of course, no one believes me that this isn't/wasn't psychological, but I had no reason to believe that ingesting the whole dose in water would make any difference but it did. I am ultra-sensitive to any change at all and I think this changed my absorption rate? So I resorted to the less expensive digital scale. My husband (former chemistry teacher) and I, (no science credentials just logic) both agree that since the valium (for instance) doesn't dissolve in the water, so it is a suspension, not a solution, so when withdrawing any amount it is questionable how much of the active ingredient is being withdrawn? I know you must stir it and withdraw it efficiently, but it sure seems that this leaves more room for margin of error than a scale. I do know most people here are successful at water tapering which is why I am hesitant to post this question. I don't want to cast a shadow of doubt on anyone who is doing okay with liquid tapering. I can't help but wonder if there is still something I am missing to this question of liquid vs. scale micro-tapering? The thing is, I am making little to no progress (even my withdrawal normal has me nearly bed-ridden), and I feel as though I have tried everything and I am getting sicker and sicker....I just read this whole thread on digital scales and your comment gave me the courage to open up this discussion. If it can be found elsewhere on this forum, I will be happy to go there. They fit like "hand and glove", and make it REALLY EASY to pour beads into the empty capsules. 10 for $1.10, free shipping. It's handy to have more than one in my case, because sometimes I'm weighing herbs, and sometimes lithium orotate, and sometimes ginger powder - don't want to get herbs in my lithium or vice versa! Other scale notes: turn off the A/C or fans, that can really get in your way. I put a nickel under the weighing tray, it is flat, and easier to use than putting the 10g weight on the tiny weigh plate. It might even be more accurate with a heavier coin, like an Aussie dollar, or a US quarter. I don't like putting the 10g weight on the weigh plate - it gives the powder more surfaces to adhere to. A coin sits UNDER the plate, and never touches the medium I am weighing. 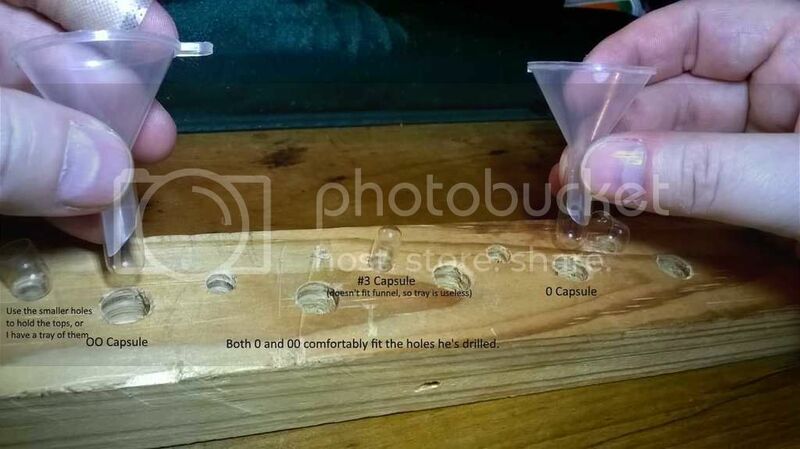 Soon, I will post the wooden thing hubby built me for filling capsules. Cheap and dirty, it does the trick. The one on the left is 0 and the one on the right is 00 (they are pretty close in size) I think I prefer the 0's, they fit more neatly in my tray, and are as easy (for me) to work with as O's. 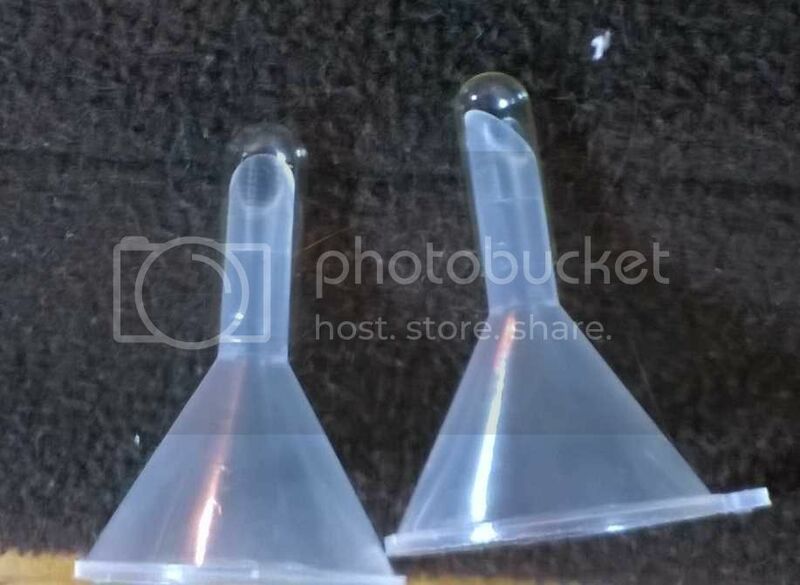 I bought some 3's and they are useless, as they don't fit the funnel. So I use it for "scooping" up herbs or clay or yogurt starter. Here is my handy dandy filling tray. We started by drilling holes for the 3's, and it turned out to be a failure - as you can't use 3's on the tray. There is one in the middle just to show size. (he could drill them out a little bit more for holding "lids" of the gelcaps more steadily. On the left is the 0, and on the right is the 00. As you can see, this was easy for anyone to make - I could've made it (but hubby was faster and more precise. Click on it to see the writing. I am new to using a scale for measuring powder medications in milligrams. I found this site when searching for information on how to accurately do this. I have ordered a medication called sodium dichloroacetate from www.pharma-dca.com . There are other sites that sell this but after communicating with the different companies I felt this one was more on the level. I will be medicating my dog who has lymphoma. This medication needs to be dosed accurately to avoid unwanted side effects. Dosing can range so I may need something that will weigh smaller amts in milligrams. I have found the scale on Amazon that is referenced quite a bit on this thread. Then I looked up the difference of a scale vs a balance. Again this is all new to me and I am trying to be as educated as possible. I cannot afford an expensive scale. Ironically the companies that sell sodium dichloroacetate sell a scale on their sites but after a little reading, I realize their scales they are offering are not what I am looking for. I will be looking to put the powder into the capsule maybe finding a glass small holder for the capsule, (I am reading plastic can sometimes be an issue bc of static?) then place the capsule in the glass holder upright- tare the scale, and spoon the powder into the capsule using my smallest incremental spoon I have. The powder is sensitive to oxygen so I have to do this in a way to not expose all the powder to the air everyday. I believe I ordered a 100g bottle. Any guidance on how to do this as accurately and safely as possible without spending a small fortune on a balance or a scale is appreciated. I realize this is not discussing an actual antidepressant med but I am hoping I can gain some insight anyways just because we are talking about accurately weighing a medication. Unfortunately when I search the Internet for info on this I get a lot of sites that are for drug users recreationally using, no judgement on that I just am concerned about the info being accurate and reliable. If anyone knows scales/balances, it is me! After researching thoroughly prior to my taper, I learned that the only accurate balances are the analytical ones that measure at least @ 0.00001g. In that range, the prices usually start at $1200, which, I realize, is out of range for many, but unfortunately, as with anything else, you get what you pay for, and since we're talking one's health, I wasn't going to compromise and just budgeted it as if I were repairing my car or getting a new computer. There may be others that measure in the mg range that are <$1000 you can find by doing a search, but again, accuracy does not come cheap. You might be able find some great deals on your local craigslist also. I sold my first balance (only a 0.0001g) I purchased for $650 for $500 on craigslist and it was brand new. I also have the cheap $20 scale that many use for tapering, but I never use it since my cuts need to be more precise being in such tiny increments. Hope that helps. The pan resembles a small bowl and you are saying to place the calibration weight in the weighing pan, can I then place something that will hold the capsule upright... And then spoon the powder into the capsule. It's one less step and avoids wasting medication. Weighing 4 mg is a pretty good scale I would think, if you feel it accurately accomplishes that I am impressed. Did you check your surfaces with a level before using one? Do you stand on an antistatic matt and place the scale on one also? Or is that overkill? As far as temp affecting accuracy, I'm in NJ and it's hot hear right now, will prob weigh in kitchen which we do not have a window unit so it's warm in there...should I be concerned about that ? I work on my drawing table and haven't had a problem with the surface being a little out of level. Any kitchen counter will be level enough to work. Static electricity shouldn't be a problem, but if the powder starts sticking to things more that usual a simple ground strap to your wrist should be enough. The Gemini-20 is designed for a working temperature range of 50 - 86 deg,F above and below that there may be some fluctuation but not enough to matter. The window unit would cause more trouble with the air currents it creates that the temperature would. Trying to weigh directly into the capsule would be very frustrating. It is necessary to add and subtract small amounts of powder to hit the correct dose. Getting powder out of the capsule would be very hard. If you reuse the Post-it note each time there will be a bit of powder that sticks to it the first time which would be lost, but subsequent uses won't loose any. The additional step of dumping the pan onto the Post-it is so quick it will more than make up for the fiddling with the capsule on the pan. As for spillage, by folding the Post-it you can funnel the powder easily into the capsule and working over a cover sheet will save any spillage. Of the many hundreds of doses I've made up, I can only remember spilling two. The dose weight of active ingredient and the weight of the powder you weigh out will be different because they are not selling you a pure medication. There is always some sort of filler involved. For me, I grind up 40mg paxil tablets that weigh 500mg each. So I get .08mgai (active ingredient for each 1mgpw (pill weight). This is how I am able to measure the tiny dose (0.42mgai) that I'm currently taking. The same will be true for the medication you will be weighing, just your numbers will be different. So a scale that can weigh 4mg will be quite adequate. BrassMonkey thank you again for responding. Do you find any powder waste with using the pan then to the post it? with the calibration weight being in the pan at the same time you are putting the medication in the pan, does any get on the weight? the medication I purchased came with a cert of analysis which states the powder is 99.2% pure. do i need to measure medication weight and subtract the filler? or is the 0.8% such a small amt that it is not necessary? This is the one time being clean doesn't help. Get a little drug powder on the weight, the pan and the Post-it. Tap off the excess and leave the rest alone. This will allow for consistent measuring with out loss. You should use the gram setting. It will read to 3 decimal places, 0.001, which will be 1mg. Boomer - that scale will be fine. It has the same resolution (measures to 0.001 mg) as the one Gemini 20 (consumer model) that others are using. able to read tinier amounts than the .001 Gemini? My doctor said I should not do liquid as I am very sensitive however I need to taper with tinier cuts now that I am under 9mg of Effexor. Also I take both the beads XR and tablets immediate release. The tablets have gotten so small that it is hard to cut. I am having wds symptoms on every cut that I make. Or should I save my money and take longer holds? Hi Lexy-- save your money. To get a decent .0001 scale will cost you many thousands of dollars and trying to weigh doses that fine will drive you nutz. Instead of cutting the IR tablets I would suggest crushing them and weighing the powder. That makes it a lot easier to work with. Get some "0" gel caps to put the powder in. Your signature indicates that you've taking larger than 10% cuts (BTW please update your sig.). That could account for the WD symptoms. Having some symptoms with every cut is going to happen. The object is to keep them as mild as possible. Do your symptoms resolve to a steady state before you do each cut? That would indicate that the hold length is working as is. I will save my money and try weighing the powder. The problem is how do I weigh such small amount? On the IR I'm at 3.5mg the rest on XR. The scale doesn't read under 3mg. I will update my signature month to month. Let me know if I should ask these questions on my intro. You have to take into account the filler in the tablet. So a 3.5mg dose is going to weigh more than 3.5mg. To figure the amount you need to weigh out we will need to know the average weight of the tablet and the dose weight for a full tablet from the bottle. Average weight of one 25mg immediate release venlafaxine is .100g. I weighed a tiny piece of tablet with the weight that comes with scale; it weighed .101g does that mean it's .25 of one mg? Would that be accurate to weigh pill with the weight on the scale. Without the weight it is not possible to measure anything below .08g which is 2mg of ven if I'm correct. Thanks for your help. I just need to plan ahead when I do get to that point of my taper. Im already stressing on that. Yes, having the weight on the scale will help make it more accurate. You can either subtract out the weight or press the "tare" button to zero the scale. There appear to be a couple of typos in the numbers you posted in the first paragraph. Would you please double check them. lol I kept checking over and barely found typo. When weighing Effexor XR beads should we not use the itty bitty ones? Are they just filler? As far as we know, the itty-bitty beads have the same composition as the larger ones. i buy scale and always Measure my meds but they become powder so how will i take them? The easiest way to handle the powder is to but a big bag of size "0" gel caps. You then weigh out the amount of powder you need for your dose and pour it into the gel cap. Close the gel cap and you're all set. Will the substance be absorbed in the body? And if I do not want to buy a capsule, can I swallow powder? You can but the taste is really disgusting. Some people mix it with orange juice, but you risk losing some of the dose that way. so why on liquid you dont losing does that way? A tiny amount of a liquid dose is lost because a small amount of liquid sticks to the sides of the glass or syringe. If you are doing this everyday, there will be no problem because you are taking the same dose every day. After putting the weighed powder in orange juice and drinking the liquid as brassmonkey suggested, you could add some water to the just-used almost-empty container, swirl the water around with what was leftover and take that. Note: this conversation may be moved to the topic on Making a liquid from a tablet or capsules . Am just wondering what I could use to line my tray on my scale please?Am going to be crushing diazpam up,an I don't know how to get the powder off the little tray..
any ideas how I transfer the powder into the capsules please? On the tray that comes with the Gemini scale, there's a little triangular funnel-like thing along part of the outer edge of the tray. This is good for pouring the powder into the capsule. So I decided to switch to a scale and bought the Gemini 20-portable Milligram Scale. I think I should be using the ozt measurement because when I weigh my 25mg lamictal tablet, it comes up as 27. So, currently I am a16mgs of Lamictal. I don't know how to do this with the scale. Do I just cut up my 25mg tablet and place the pieces into the tray till it weighs 16mg? You will need to use gram because this is what mg (milligrams) is. The tablet contains 25mg of the drug Lamictal (lamotrigine). The tablet will weigh more because it has fillers in it. To get a more accurate weight of a single tablet, weight a larger quantity of tablets and then divide the number of milligrams by the number of tablets. Once you have the weight of one tablet you will need to divide that by 25mg. So as an example if the tablet weighs 30mg and the dose of the tablet is 25mg, divide 30 by 25. Each 1.2mg of tablet weight will contain 1mg dose of drug. Now multiply 1.2mg (tablet weight) x 15 (wanted dose) = 21.6mg tablet weight that you need to measure on the scale. Thank you Chessie, I appreciate the clarity.